^ "Google Talk Discontinued; Users Told To Switch To Hangouts App". Yibada. Sayan Bandyopadhyay. Retrieved 16 February 2015. ^ Amadeo, Ron. "Google Hangouts 7.0 for Android asks users to stop using it for SMS". Ars technica. Ars technica. Retrieved 29 January 2016. ^ Statt, Nick (25 January 2017). "Google's second Allo messaging bot is an AI-driven GIF generator". TheVerge. Retrieved 19 July 2017. ^ Townsend, Tess (11 May 2017). "Google's Allo app has a new AI-powered illustrated selfie feature". Recode. Retrieved 19 July 2017. ^ Hall, Stephen (2016-10-14). "Google's Pixel ships with Hangouts disabled in favor of Allo and Duo". 9to5Google. Retrieved 2016-10-27. ^ "Even With Allo And Duo, Hangouts Will Remain As A Separate App In Google's Ecosystem". Android Police. 2016-05-18. Retrieved 2016-05-19. 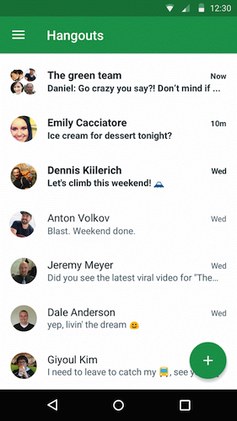 ^ "Google isn't abandoning Hangouts for its new chat apps". Engadget. Retrieved 2016-05-19. ^ "Google Hangouts API gets hung out to dry". TechCrunch. 2017-01-06. Retrieved 2017-05-23. ^ "Google Hangouts is getting a major overhaul to take on Slack". The Verge. Retrieved 2018-12-01. ^ Smith, Josh. "Google Hangouts SMS and Google Voice Won't Work Together Until 2014". Retrieved 3 December 2013. ^ O'Kane, Sean (2016-08-15). "Google is killing off Hangouts on Air in September | The Verge". Retrieved 2016-08-24. ^ "Google outed me". Retrieved 27 January 2014. ^ "The Best Android Apps". Make Use Of. 30 November 2014. ^ "Secure Messaging Scorecard. Which apps and tools actually keep your messages safe?". Electronic Frontier Foundation. 4 November 2014. Retrieved 9 December 2015. This page was last edited on 18 April 2019, at 21:22 (UTC).